When it comes to poker stories, whether it be a hand history or some other tale inspired by something that happened at the tables, there’s a fairly common sign-off, used frequently enough to have edged over into the ignominious status of cliché. Usually it comes following the description of an unlikely sequence of events or improbable outcome to a hand such as often characterizes a bad beat story. It can appear at the conclusions of other types of poker stories as well, though, as a terse, trite termination. It’s the verbal equivalent of a fate-accepting shrug, usually indicating having reached a kind of narrative threshold beyond which there are no further plot twists or salient details left to share. It also marks the speaker having exhausted his or her supply of insight, having no more commentary left to help explain what has been related to that point. You’ve heard the phrase yourself many times, I’m sure. And if you’re like most of us, you’ve probably been guilty of occasionally using it, too, as a way to signal you’ve got nothing more to add to your poker parable. It’s so common, a few of my friends and I have started using the phrase ironically with each other, as a joking reference to the lack of imagination that sometimes possesses we flawed storytellers. Or as a parodic way of punctuating a hand report. It reminds me a little of student compositions. Conclusions are often especially challenging for fledgling writers of academic essays, although in my experience many of my students were at least able to summarize everything that had already been said, which functioned as one kind of unexciting though appropriate enough way to fill out a word count requirement. I’d often recommend all sorts of maneuvers to prevent the conclusion from being redundant, including “stepping back” from whatever point the paper had made and discussing it in a broader context, if possible. But for many that was easier said than done. I would always respond by suggesting that better openers existed -- in fact, that anything else would be better -- more or less prohibiting such generic starters that often had little to do with the actual subject at hand. But again, it was easier for me to point that out than for some to come up with anything better. But “that’s poker” actually does say more than simply “I have nothing else to say.” It’s a statement of acceptance, perhaps even a kind of surrender, reaffirming the game’s ability to bewilder. It’s an easy line to ridicule. But I guess at its root it’s pointing out (again) how ridiculous the game can make us. 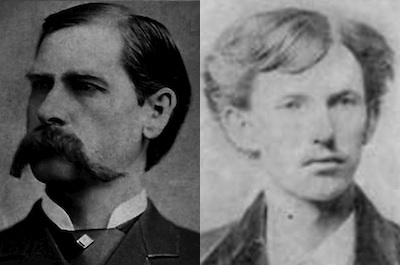 This week’s “Poker & Pop Culture” column focuses on the gambling gunfighers Wyatt Earp and Doc Holliday. In real life, their stories intersected a few times, with the lawman and dentist most famously meeting up in Tombstone for the legendary “gunfight at the O.K. Corral.” Most agree the actual fight only took thirty seconds (and not exactly at the O.K. Corral), with the “good guys” (Earp, his two brothers, and Holliday) dominating the outlaws (the Clantons and McLaurys). But later on it was embellished and expanded considerably, especially in the dozens of films made featuring Earp and Holliday. There a few stories about both Earp and Holliday playing poker, although they’re mostly lacking detail other than perhaps mentioning a location and/or the stakes or amount won or lost. Rather than stay back in the 19th century chasing down historical tumbleweeds, for the column I focused on a few of the more interesting films featuring the pair -- My Darling Clementine (1946), Gunfight at the O.K. Corral (1957), Cheyenne Autumn (1964), and Tombstone (1993). I focused mainly on how poker is used in those films, both to help shape the characters of Earp and Holliday and to reflect larger themes of the films and their portrayals of the Old West. The parallel between poker and gunfighting is unsubtle in most westerns, really, both being presented as high-stakes “games” in which the players have to make their own rules and agree to abide by them. In the “Wild West” that agreement is always quite tenuous, which means like the gunfights the poker games also tend to end violently. But all the films mess with the characters and the history. With Clementine, director John Ford even wanted to change all the character names since the script had gravitated so far from reality, but the studio wouldn’t let him. There’s a bit more to talk about with regard to “saloon poker,” but I thought it was worthwhile bringing in some of the westerns that so greatly shape and alter our view of the Old West -- and of poker. Photos: Wyatt Earp, Doc Holliday, public domain. I think any of us who work long enough “in poker” -- as players, staff or tournament organizers, agents, promoters, reporters and “media,” or in other capacities -- end up collecting quite a few stories that we can’t really share, for a variety of reasons. Some of the stories can’t be told because they involve “sensitive” information never intended to be publicized. Others have to remain hidden because they might endanger a person’s current employment. Still more are kept quiet because they reflect badly on either the one telling the story or others who for whatever reason are judged not to deserve such treatment. I know over the ten-plus years of this blog I’ve “self-censored” a number of times, although to be honest I wouldn’t suggest any the stories I’ve suppressed were all that scandalous. One of the stories I consciously chose not to tell before I’m gonna share today, as it seems both a little timely and at this far remove fairly innocuous. 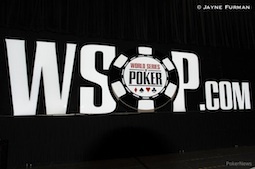 My first time covering the World Series of Poker was for PokerNews back in 2008, and as I’ve written about here many times before during those first couple of summers everything seemed especially interesting and exciting thanks largely to the novelty of it all. The interest remained even by the fifth or sixth summer I was there, even if the excitement had waned a bit by then. 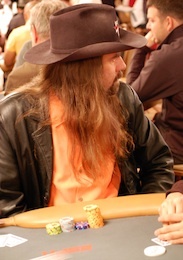 Chris Ferguson -- a.k.a. “Jesus” (a nickname I tend not to employ anymore) -- was of course one of the more recognizable “poker celebs” back then. One of the early events I helped cover in 2009 was a $2,500 buy-in pot-limit hold’em/pot-limit Omaha event, and Ferguson played. While at the table he had out his phone and was playing Chinese poker, and I remember writing a live update in which I mentioned this fact. It was kind of a novel thing back then to see someone on a device playing a different poker game while at the table -- not nearly as ubiquitous as it would soon become -- making for a bit of color worth mentioning amid an otherwise not-so-exciting Day 1. Kind of thing wouldn’t deserve being pointed out even a year later, I’d say, but at that time it was curious enough to include. I seem to recall making a joke in the update about two games not being enough, since the tourney featured PLH and PLO and Ferguson was playing a third game on his phone. Anyhow, in my next “travel report” post here on the blog, I retold that story and a few others from the day. When referencing Ferguson, I said something about peeking over his shoulder to see him playing Chinese poker, taking a bit of poetic license in the way I described the scene (as though I had captured a little “inside dope”). Truthfully, there was no reason to look all that closely to see what he was playing. In fact, he was talking about the game with Andy Bloch who asked him about it. In that post I also mentioned an “Approved Electronic Device Rule” the WSOP had in place that year which was not being enforced at all. I explicitly said I didn’t care one way or the other about players being on phones or other devices while playing, but I did note it seemed inconsistent to have a rule that no one heeded and that no one seemed interested in requiring anyone to heed. There was a short sequel to the story -- this is the part I haven’t told before. The next day I was back at the Rio where I first heard from a fellow reporter, then from the head of the team something about Ferguson not being happy with my posting about his Chinese poker playing. It was never 100% clear to me whether the objection concerned the live update or my HBP post (it seems like it was the latter, actually), but apparently “Jesus” was concerned enough to have spoken to then-WSOP Commissioner Jeffrey Pollack about it. This is all very vague in my memory, I’m afraid, but I have a fleeting recollection of Ferguson having said something about how the WSOP shouldn’t allow the reporters to nose around in private business, with there even being some suggestion about credentials being revoked. However severe his objection really was, Ferguson was eventually told whatever he needed to be told, and the matter went no further. 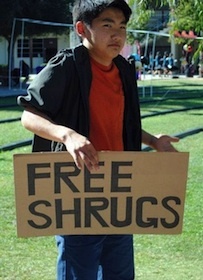 Meanwhile I was assured I’d done nothing wrong -- either in the live updates or on my blog -- and not to worry about it. I also remember being told how Ferguson and I would probably get along quite well -- that we have similar personalities and interests, and seemed like we’d hit it off. Needless to say, I never sought out meeting him to find out if that were true. I didn’t tell the story at the time partly because I was a little embarrassed by it, even if I shouldn’t have been. As a reporter, I didn’t like being noticed at all, never mind in a negative way. And if given the choice, I would have much rather reported that Ferguson liked me than that he had been made upset by anything I’d done. I thought about the story again after Ferguson made his inglorious return to the WSOP earlier this month. When asked by PokerNews if he had anything to say regarding his absence since 2010 and/or his feelings regarding what had happened with Full Tilt Poker, he repeatedly responded “I’m just here to play poker.” It was a little like back in ’09, when he didn’t like anyone reporting on his doing anything other than playing in an event. Ferguson has cashed seven times already this summer, including finishing fourth in an event over the weekend. His appearance at that final table created a bit of a stir, as PokerListings described in detail. He was asked again about whether or not he planned to apologize to the poker community, he responded “What are you talking about? No comment” before walking away. Howard Lederer has also returned to the WSOP, the prospect of which I wrote about here back in May following his apology (which seemed at the time an unsubtle prelude to his returning). I mentioned in that post how his playing in any events would be a bit like men playing in the ladies event, necessarily producing a lot of unpleasantness and ill will, especially should he be successful. The same obviously goes for Ferguson, and it sounds a lot like that final table scene over the weekend confirmed that prediction. Of course, while Lederer’s apology caused us to wonder about his sincerity, Ferguson seems unequivocally sincere in his non-avowal of responsibility for what happened at Full Tilt Poker. No, people aren’t really loving Ferguson very much these days, and his success in WSOP events only seems to be adding still more negativity to a poker community he and others damaged so greatly already. Can’t say I’m that bothered, though, given how I found out long ago “Jesus” didn’t love me. Image: “Jesus eyes the next table,” Matt Waldron. CC BY 2.0. Feel a bit for Lionel Messi, the footballing legend from Rosario who missed a penalty kick in last night’s Copa America finale for Argentina, with his team subsequently losing to Chile for a second straight Copa final. Following the match, Messi announced he’d no longer be playing for the Argentinian team, a bit of a surprise even if (apparently) there might have been other reasons for his decision besides last night’s outcome. Still, if they’d won, it doesn’t seem likely he’d have made such an announcement so soon after the match (within an hour of its ending, I think). I ended up watching the match quite closely, which seemed a bit chaotic with the refs’ control appearing tenuous for much of the way. Argentina clearly seemed the better side -- and I think all agree Messi was the best player on the pitch -- but Chile battled gamely to get it to PKs, and ended up making one more than Argentina to secure the win. People compare the mental challenge of a penalty kick to other sports-related tests like hitting a free throw or making a putt in golf. Not really sure if the three are all that like one another, to be honest, but I can see why the comparison is a tempting one to make. I’ve read online that the average success rate for PKs tends to be around 75%. That’s very close to the league average for free throws made in the NBA, which has been right around 75% for the last 15 years or so. That same 75% figure applies to putts of around six feet or so among PGA Tour players, who naturally make a lot higher percentage from closer in and a lower percentage the further out you go (with eight feet marking the point where they start dipping below 50%). I suppose for Messi you’d expect a higher percentage of makes, and certainly a higher percentage of PK shots that at least would be successful if not for a goalie’s defense. (Messi’s shot cleared the crossbar last night.) Still, it more or less comes down to a higher pocket pair-versus-lower pocket pair scenario -- about a 4-to-1 favorite -- meaning it’ll happen, and not all that rarely, that there will be a miss. Just like some poker hands, though, some shots are more important than others, and are thus remembered more vividly and recounted more often. 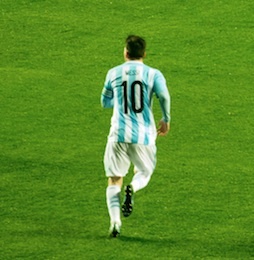 Image: “Messi 10” (adapted), Francisco Javier Gutierrez Zuñiga. CC BY-ND 2.0. 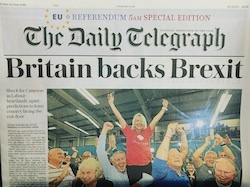 Woke this morning to discover the result of the United Kingdom European Union membership referendum -- a.k.a., “Brexit.” A majority (albeit a slight one) of Brits voted “Leave” and now the United Kingdom will no longer be part of the European Union, leaving the other 27 EU countries behind. Adding further to the uncertainty, Prime Minister David Cameron (who supported “Remain”) has said he will be stepping down, letting his successor handle the consequences. I’m not even going to try to offer any sort of comment about the result. Like many over here in the U.S., I only became aware of the vote relatively recently. I had heard about it a couple of months ago, but only began reading about it a couple of weeks back. And while I can’t help but react to the reactions today, many of which are quite earnest and passionate, I wouldn’t dare pretend to pull together and advance some hastily-discovered evaluation of the result (or to venture to speculate about what may come next). There are a couple of items related to Brexit that stand out as remarkable (from this great distance). One is how quickly the referendum appeared, even if it were the result of many years of debate over the issue of the U.K.’s membership in the European Union. Reading around, it seems to have first surfaced in a concrete way about a year ago (mentioned in the Queen’s Speech in May 2015), then the voting date was announced in February. The other aspect of the vote that stands out is how close it was (about 51.9% to 48.1%), a result highlighting the fact that only a simple majority was needed to decide something so momentous. Given such a close margin, whichever way the vote might have gone, it was destined to create a huge internal divide. I’d compare it to a close vote in a U.S. presidential election, although the result there isn’t necessarily the same. If you look at the popular vote (and not the Electoral College) for elections dating back to 1960, you find that many times the percentage difference between the top two presidential candidates in those races has been smaller than the 3.8% difference in the Brexit vote: 1960 (0.17%), 1968 (0.7%), 1976 (2.06%), 2000 (0.51%), and 2004 (2.46%). (Actually in 2000 that difference is in favor of the loser, Al Gore, who had the small edge over George W. Bush in the popular vote, but lost in the Electoral College.) In the most recent election in 2012, Barack Obama got just a little more of the popular vote (3.86%), percentage-wise, than did “Leave” in the Brexit vote. However, as I say, those results don’t really provide a good analogue at all. The closeness of those elections certainly meant the winners didn’t have a “mandate” going forward. But those presidents still had power, as did the opposing parties that retained plenty of representation (often majorities) in the legislative branch. In fact, Brexit almost feels more like a “coin flip” in poker -- an even money proposition, in which the winner takes all. Image: “Brexit,” Christopher Michel. CC BY 2.0. With the NBA season over and the NFL’s first regular season game not scheduled until September 8, sports fans are facing a long summer. Baseball, tennis, and golf can occasionally work as a stop-gap. The conclusions of both the Copa America and UEFA European Championships will also provide some diversion for those with an interest. And of course the 2016 Summer Olympics in Brazil, set to play out from August 5-21, will be welcomed by sports fans, too. But for the majority of sports fans -- in the U.S., at least -- these are the super-slow months, with none of these options necessarily presenting too much that tempts. Meanwhile the World Series of Poker continues. Poker fans are already following what’s happening out in Las Vegas this summer via updates and the various reporting sites. But once again -- as I’ve thought before right around this time of year -- it seems like there’s an opportunity perhaps being missed. I mentioned yesterday how I’ve dipped into the live streams now and then on WSOP.com this summer and have been impressed, particularly with the stud games where they’ve discovered a method to handle the graphics in what seems to me a viewer-friendly way. I don’t really think any of these preliminary events necessarily warrant a larger platform, although I found myself imagining half-hour recaps of key final table moments being shown on one of the many sports networks. WSOP.com is already doing something similar at times when showing highlights/bustout hands from past final tables while waiting for a new stream to begin. I do think, though, that ESPN could well do something with the Main Event in July to fill a week’s worth of otherwise slow summer nights, sports-wise. I know there’s the long-standing argument that ESPN wants to avoid potentially affecting viewership negatively for the weekly edited shows -- that tend to air opposite NFL games, actually -- by showing Main Event coverage in July. If memory serves, 2011 was the only year they did try some July shows from the Main Event, to mixed reviews. Unfortunately, not only won’t there be anything like that on ESPN in July, but there won’t even be any live streaming of the Main Event either. Ah well... there will probably a baseball game on somewhere. 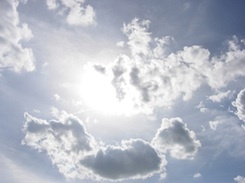 Image: “Blue Skies & Hot Sun” (adapted), Michele Frazier. CC BY 2.0. In case you haven’t heard, it looks as though WSOP.com has removed from the site a requirement for users to login via Facebook or Google+ in order to view live updates, chip counts, and results from 2016 World Series of Poker bracelet events. The login “gateway” only worked on some browsers and there were several easy ways to go around the hurdle rather than jump over it by signing in, but now anyone can access the updates right away without having to share any personal information (or made-up info associated with a dummy account). Earlier word had been that they weren't “budging” on this one and the gateway was permanent, I’m pleased the decision was made to remove the login requirement. I won’t rehearse the many reasons why I disliked it (a few of which are alluded to here). Hopefully those who visited the site before and were disinclined to login will get the news and return. So far Jason Mercier’s incredible streak last week to win a $10K event, take runner-up in another $10K, then win the next $10K he played has easily been the most intriguing WSOP story to follow, made even more intriguing by all of the bracelet bets including the much-discussed one with Vanessa Selbst that go so much coverage last week. I had tossed out a prediction at the start of the series over on PokerNews that there would be three multiple-bracelet winners this year, and in fact there have been three already. Over the weekend Ian Johns joined Mercier in the two-timers club, then Benny Glaser won his second of the summer last night. So now everyone is less hamstrung to follow updates. I will say the live streams (which didn’t require the login) have been fun so far, and I’m a little wowed by the graphics on the non-hold’em games -- probably as good as I’ve seen before for those. Check out those streams here, and if you’re curious, follow them updates, too -- they’re just a click away. I have now made it through the five parts of ESPN’s O.J. 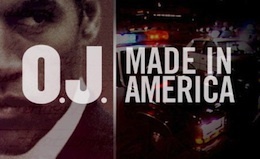 : Made in America, all seven hours and 44 minutes of it. I suppose watching and playing in poker tournaments -- or maybe it’s all those transatlantic flights I’ve taken -- has made sitting through nearly eight hours of anything seem a lot less remarkable than it was before. The reviews of the film, directed and produced by Ezra Edelman, have been consistently glowing, and I, too, thought it very good and compelling throughout. Errol Morris (The Thin Blue Line, The Fog of War) is an obvious influence (narrative pace, music, editing, interview format), and as I greatly enjoy Morris’s films and storytelling style that ensured I was hooked from early in the first hour. I knew a lot about Simpson’s background, though the film presents numerous details that were new to me (and to most viewers, I’d imagine). Much of what was presented concerning the murders and trial was very familiar, while some of the participants’ reflections were interesting to hear articulated for the first time. The civil case (in which Simpson was found responsible for the murders) was mostly familiar ground as well for those who followed it when it happened. Meanwhile the entire post-trials sequence detailing Simpson’s downward spiral into decadence and his eventual arrest, conviction, and imprisonment in Nevada for a different crime was mostly new to me. The film clarifies in a comprehensive way how studying the complicated legacy of race relations both in southern California and Los Angeles in particular and in the nation as a whole adds considerably to our understanding of why the trial played out as it did. It also sheds light on Simpson’s own strange, frighteningly-destructive psychological makeup, which helps explain -- as much as is possible, anyway -- how exactly he had become a person able to perpetrate such horrors. “There was nothing ever, ever in the past that would indicate would be capable of doing what he’s doing right now” says Al Michaels on air during the Bronco chase, articulating the position of the great majority of the public at the time who thought they knew Simpson but really did not. The film helps make it clear that not only was Simpson capable, but predisposed to commit such acts. In the end, I appreciated the lengthy exposition (i.e., the first two parts) a bit more than the narrative of the trial and its aftermath, probably because the latter was on the whole both more familiar to me and tended to be overwhelmed at several points by the incredibly sensational aspects of the murders and trial. As I say, the argument that race relations was a key component to America’s “making” a figure like O.J. was persuasive and thorough. But when it was over I was thinking also about other influences upon attitudes and values -- namely, sports, celebrity, and money/class -- all suggested as well by the film, but not explored as fully. Of course, that might’ve carried the film another couple of hours further, as it didn’t appear there was much included that didn’t seem to belong. I’ll finish with one last observation about the documentary. Early on it is established how Simpson not only avoided drawing attention to race and the many injustices marking race relations as his personal fame and cultural stature grew, but overtly defended his right to pursue self-interest. The position is uniformly opposed by others in the film, and indeed Simpson’s lack of interest in any larger community is made to appear monstrous -- another piece of evidence presented to explain Simpson’s narcissism and lack of regard for anyone but himself. As that case was being made, though, I found myself thinking -- how unusual is that position, really? Especially today. We’re surrounded by others adopting the exact same approach to society at large and their place within it, not feeling any responsibility at all to the “community” and appearing exclusively and unembarrassedly motivated by self-improvement. Cleveland finally did it. Was a highly entertaining finale to the NBA season last night. LeBron James gets the hero title, of course, even if Kyrie Irving was the one hitting the game-winner. Meanwhile the Warriors couldn’t find a hero of their own despite a valiant effort from Draymond Green to play that role. I want to say relying on three-pointer necessarily invites the sort of variance shown last night (GS hot in first half, cold in second), although the way the Dubs shot from the arc this year they seemed to challenge that oft-cited claim to the point of making us all doubt it actually applied to them. Speaking of going home, looks like the Cavs hit Vegas last night on their way back to Ohio. That’s where I was the last two times the NBA Finals featured a Game 7 -- in 2010 and 2013 -- so it was fun to be able to sit down and actually watch such an event this time around. Incidentally, Jason Mercier’s last seven days in Vegas have been something else, too, with the two bracelet wins a runner-up, and his securing added bounties of all those many side bets. It feels like this summer the side action is in some cases overwhelming the main prize pools, creating some added storylines. Looking back at my post from Friday, I made a few predictions for Game 7, although most were non-specific enough to have a better than average shot of being accurate. There’s no doubt the Warriors suffered a most ignominious conclusion to their record-setting season, becoming the first team to lose a 3-1 lead in the finals. I also said the Cavs wouldn’t be as consistently brilliant as they’d been in the previous two games (they weren’t) and the Warriors wouldn’t be as consistently bad (they weren’t either). Suggested there would be evidence of some nerves, too, especially at the start and the finish, and that’s exactly what happened as the game started very slowly, then both teams had trouble scoring during the endgame (with GS incredibly going the last four-and-a-half minutes without scoring a point). In a way all of these predictions were a little like “side action,” not unlike prop bets or inventing other in-game contests to up the interest level. My “hot take” on Friday was to suggest there’d be a controversial call (or non-call) that many would highlight after the game as having affected the outcome, but I can’t really say that happened. There were a few missed calls and questionable fouls during the course of the game, but on the whole the refs did an admirable job, I thought, and I noticed nothing especially egregious down the stretch when it really was a situation when a single whistle could’ve changed everything. In fact, the only example I can think of was Andre Iguodala’s block of LeBron James’s layup with exactly three minutes to go in which Iguodala got mostly hand and little ball. As it turned out, it was over at the U.S. Open where it looked as though a ruling really would inordinately affect the outcome. I won’t go into the whole story of the delayed one-stroke penalty assessed to eventual winner Dustin Johnson -- you can read about it here -- but will say it seemed a terrible example of the rules and the mechanism of enforcing the rules potentially overwhelming the players’ control over the competition. Can’t say I had much of a rooting interest in that one, although like most I was glad to see Johnson overcome what seemed an unfair circumstance to succeed. Didn’t really have a rooting interest in Cavs-Dubs, either, which I realized I was glad about as the fourth quarter was winding down. I was flashing back both to this year’s Super Bowl (where my Panthers fell) and the NCAA final (where my Heels lost a heartbreaker). It’s much less stressful watching without such intense feelings about how the sucker is going to turn out. Makes it easier, too, to be less critical of the refs. Without a focus on perspective-altering goals, outcomes can be more clearly assessed. 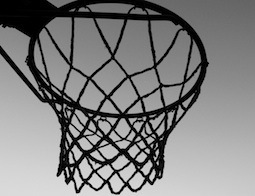 Image: “Basketball Net” (adapted), Akash Kataruka. CC BY-ND 2.0. So the NBA Finals has turned into some kind of weird, twisty-turney soap opera with six fairly non-competitive games resulting in a 3-3 tie between Golden State and Cleveland. Even if Game 7 results in yet another blowout, it will nonetheless provide an intriguing climax to an unexpectedly gripping series to punctuate the season. 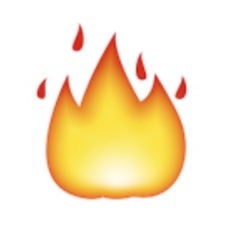 One sure-fire prediction -- whoever loses the game will be forced to endure an incredible letdown. For the Warriors, it would mean failing to cap a record-breaking regular season with a title. The Cavs would similarly suffer greatly with a loss, coming one step shy of completing a never-before-accomplished comeback from 3-1 down in the finals to lose in the finals a second straight time. I’ll add a few other predictions I’m less sure of, but in which I’m still reasonably confident. The Cavs probably won’t be as consistently brilliant as they were in Games 5 and 6. Neither will the Warriors be as consistently bad. Both will likely show some evidence of nerves, too, especially early in the game and perhaps again near the end (depending on the closeness of the score). But here’s a less obvious prediction I’ll throw on top of the bonfire of “hot takes” that’s already starting to build, will grow higher by Sunday night, then disappear like so much ash in the wind once a result is determined. This one is probably contingent on the game being close at some point beyond the start -- i.e., in the second half, either early or late. From the referees there will be a judgment call (or non-call) that will be agreed upon afterwards by most viewers to have affected the game’s outcome. Every sport adjudicated by human beings involves some degree of error. Happens in poker, too, when rulings based on partial or even incorrect evidence sometimes occur, or even incorrect rulings based on clear and complete (and misunderstood or misinterpreted) evidence occasionally arise. Over the course of an NBA basketball game, refs collectively make hundreds of decisions. They never make it through an entire game getting every decision correct, although generally do hit the mark on most of them. I’m not predicting (necessarily) that there will be an incorrect decision that will affect the outcome of Sunday night’s game; rather, I’m suggesting that some judgment call (which may or may not involve bad judgment and thus an incorrect decision) will be considered by most watching as having inordinately affected the outcome. I guess my prediction itself involves a kind of judgment, although I’m saying most of those watching will come to the same conclusion that a key call (or non-call) more or less decided the game. It’s a prediction partly about the game and partly about how it will be discussed Monday morning, and it’s based both on the way the NBA games currently are officiated and tend to play out and the way games are scrutinized and discussed today. Within a minute or two, the call (or non-call) will be a Vine, delivered instantly like an outlet pass starting a fast break all over the web. And many will be hot, hot, hot about what they are sharing. Visitors of the blog may have noticed I haven’t been writing here about the big tournament series happening in Las Vegas like I did for the 10 previous summers. Or not. In any case, there are plenty of other places to read about what’s happening out there just now, so I trust I’m not creating any sort of void here. That doesn’t mean I’m not supporting the efforts of the many who are reporting all summer from Las Vegas, including the official live updates team. I have a number of friends playing various roles in that group, and have been chatting with several over the last couple of weeks as they’ve started down the long, winding road that doesn’t end until mid-July. Haven’t been on the road myself for about a month. But I was reminded again of the travails of the tourney reporter today, including the occasional marathon days-slash-nights-slash-early-mornings they end up having to endure. A couple of times, actually. The first was early this morning, when I realized Mo Nuwwarah was still reporting from the iNinja World Championship at Planet Hollywood for PokerNews. And in fact he would be another six hours or so, making for what I think might have been around a 20-hour final day in that event. Sure, that’s some very specific click bait. But it worked! As I have done here many times before, Darrel’s both reporting on tournaments and chronicling his adventures doing so on his blog. 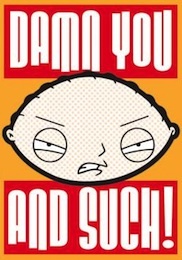 Click on that above link and find out why he’s out there cursing me while he does. 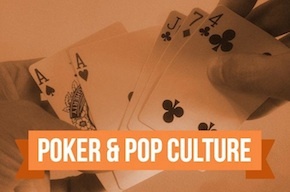 For a few different reasons -- including this new “Poker & Pop Culture” series of articles I’m writing for PokerNews -- I’m finding myself burrowing deep in digressive, distracting paths after uncovering this or that historical nugget about people in the past playing poker. Recently there came one such distraction as I called up a copy of the September 1, 1934 Reading Eagle, the daily newspaper of Reading, Pennsylvania. In that issue appears a review of a new poker strategy book called the Stud Poker Blue Book by George Henry Fisher that had first been published three years before. The review of Fisher’s book -- written by Westbrook Pegler as an installment of his regular column, titled “Fair Enough” -- is a positive one, ending with a few almost tongue-in-cheek complaints about bridge having come to rival poker in popularity. “For some reason bridge has claimed rating as the gentleman’s game and is considered to be desirable nowadays as a part of the social equipment of young officers of the army, along with dancing, tennis and the etiquette of the seven-fork formal dinner,” writes a derisive-sounding Pegler. Amid the kidding, I had to follow-up the reference to Franklin D. Roosevelt’s then-VP, John Nance Garner. FDR was of course an avid poker player, but I’d never thought much about Garner or his playing, so it was intriguing to see a casual reference to his stud expertise dropped here at the end of Pegler’s review. From what James McManus says about Garner in Cowboys Full, he actually “had grown up playing high-stakes draw” before becoming the stud expert (as Pegler calls him). McManus also points out how Garner wasn’t invited to FDR’s poker games, with their relationship deteriorating to the point that Roosevelt instead chose Henry Wallace to run with him as he won a third term. Incidentally, Garner would live to a ripe old age of 98. His 95th birthday happened to be November 22, 1963, the day John F. Kennedy was assassinated. Kennedy phoned Garner that morning at his home in Uvalde, Texas to wish him a happy birthday. Dan Rather -- then normally stationed in New Orleans -- was in Uvalde that morning to film a short piece with Garner, and had carried it to KRLD in Dallas where he dropped it off. Without an assignment for the rest of the day, Rather stuck around to watch the Kennedy motorcade. Shortly afterward he was among the first to pass along the news JFK had died, his report being picked up and shared over CBS radio even before Walter Cronkite’s famous pronouncement. There’s more to Cactus Jack’s poker story, I’m sure, though I’ve yet to dig further. Perhaps he was just too good of a player for FDR to want hanging around. In any case, that nickname suggests he was probably considered a bit prickly by others, too. 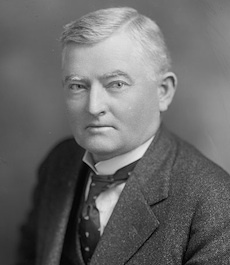 Image: John Nance Garner, public domain. I am recalling at least three occasions when acts of violence so horrific and massive have occurred in this country, I’ve found myself unable not to write about them here on HBP. This is a poker blog, after all, and while I’ll often write about sports, politics, entertainment, business, music, and other non-poker topics including what it’s like living on a horse farm, I still try to keep things oriented in the direction of poker, which necessarily leaves certain topics out of the mix. One was the shooting at Virginia Tech in April 2007, prompting in part a meditation on college classrooms (where I’ve spent so much of my adult life, including then when I was teaching full-time). Another was the one at Sandy Hook Elementary in Newtown, Connecticut in December 2012, also taking place at a school, with many children among the victims. The shooting at the Pulse nightclub in Orlando early Sunday morning has again forced all of us out of our respective cocoons. Or has it? Beyond the horror of the scene and the extent of pain inflicted, there’s that unsettling sense already that even the “deadliest mass shooting in American history” -- as some (not all) have described it -- hasn’t necessarily moved the collective to a point of acting in response. Remember the Harrington on Hold’em books, and that explanation of “inflection points” that comes up in the second volume? That’s the concept associated with the famous “M” ratio signaling how many orbits you have left according to your stack size, and the corresponding “zones” (green, yellow, orange, red, and “dead”) meant to identify what sort of maneuverability you have left according to your remaining chips. Regarding inflection points, authors Dan Harrington and Bill Robertie introduce the concept by way of a football analogy, referring to a team that is behind having to jettison certain plays from their playbook in order to preserve time and score fast. As the clock winds down, multiple “inflection points” are crossed -- i.e., first short runs are out, then all running plays, then even short passes aren’t viable as the seconds tick away. Finally a team’s options are whittled down to just one -- a long Hail Mary pass into the endzone. Similarly in tournaments, they explain, when your stack gets too short your reduced to just a few moves, then eventually only the one of going all in. Each time you reach an inflection point, you must actively recognize certain options are no longer available to you. I feel like each of these shootings first appear as though they could represent “inflection points” insofar as they seem initially to encourage both dialogue and even action designed to reduce the chances of another occurring. But we never seem to reach the inflection point beyond which the option just to keep on sitting tight is no longer available to us. Perhaps as a collective we’re overwhelmed by the seeming impotence of the majority in the face of those in power (or, in this election year, those seeking power) -- that is to say, those whose all-encompassing motive is to preserve their comparatively elite status. Such a goal is usually best achieved by continuing to encourage all to keep on sitting tight -- that is to say, to prevent us from thinking we’ve crossed an inflection point beyond which some sort of drastic, culture-changing, life-altering action emerges as the only option left. There’s a point somewhere, I’m sure of it, which if reached will finally force our hand in some constructive way to make such acts of violence less likely. What’s most chilling is to try to imagine what must happen in order for us to get there. 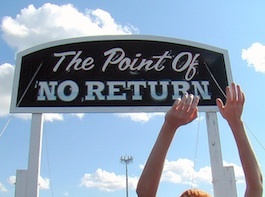 Image: “The Point of No Return,” Pat Hawks. CC BY 2.0. An interesting “what would you do?”-type poker discussion to share with you, if you haven’t seen it already. There Jones describes playing in a $1/$2 cash game and having the good fortune of flopping an ace-high flush versus a lone opponent. His leading bet was called, then after Jones still had the nuts following the turn card, he bet again and this time was raised. At that Jones reraised back, his opponent announced “all in,” and Jones quickly called, showing his cards. That’s when the story becomes interesting enough to write a post about. Upon seeing Jones’s hand, his opponent then claims not to have said “all in.” Meanwhile the dealer had heard him say it, and after the floor was called another player said he heard it, too. Skipping ahead a bit, in the face of all the growing hubbub Jones ultimately decides to let his opponent “off the hook” and not be forced to go all in, with Jones just taking what was in the middle as if the player had folded and not shoved. Jones explains he honestly didn’t think the player was trying to angle shoot, but he doesn’t spell out all the reasons why he thinks that way. It’s a nice story, and like most I tend to like these hearing such tales of good sportsmanship in poker and in other contexts. But yesterday Rob of Rob’s Vegas and Poker Blog posted a response to Jones’s post in which he respectfully suggests Jones should not have been so generous. In “He Let This One Off the Hook -- But Should He Have?” Rob points out how letting his opponent wiggle his free negatively affects the integrity of the game. “If we allow someone to say ‘all-in’ and not really mean it, the game falls apart,” says Rob. It’s a persuasive point. As I read both posts, I thought about how in a tournament setting such a situation could never be condoned -- there letting someone call “all in” and then take it back not only affects the players in the hand, but everyone else, too. In a cash game one might argue differently, but as Rob notes it’s still important that everyone abide by the rules, and that the players not be allowed to let each other not follow them when occasions such as this one arises. When looked at in a vacuum -- i.e., without the session-specific info about the player and situation Jones possessed when making his decision -- I’d lean toward Rob’s way of thinking here when it comes to not letting players “off the hook” like this. Indeed, even imagining extenuating circumstances, I think it’d be hard for me to imagine justifying allowing someone not to have to commit chips after verbally agreeing to do so. Anyhow, check out both posts and decide for yourself. 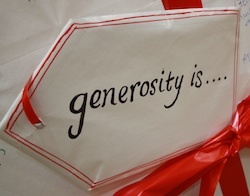 Image: “IMG_4600” (adapted), Stewardship - Transforming Generosity. CC BY 2.0. Am following those NBA finals, natch, and intrigued by this phenomenon that’s been occurring here and there throughout the playoffs -- teams falling behind by double-digits, then essentially getting “knocked out” early in games that subsequently become lopsided, ending with margins of 15 or more. That’s what happened to the Golden State Warriors in Game 3 in their game in Cleveland versus the Cavaliers. Happened a couple of times to the Dubs during the Oklahoma City series, too, causing them to fall to a dangerous 3-1 deficit before they stormed back to clinch that one. Other teams have shown that tendency as well. Just went back counted and out of 82 playoff games so far 33 of them have been decided by 15 or more (just over 40%) -- including all three so far in the finals -- with well over half having ended with wins by at least double-digits. I don’t know if this is typical or not for the NBA playoffs, but it’s sure seemed like there have been more blowouts than normal this year. Feels as though a lot of it has to do with fatigue -- that teams get down, then reach a “tipping point” of sorts where the energy needed to mount a comeback either isn’t available or needs to be conserved in order to remain competitive in the next game. “On to the next one,” teams seem to be saying, although in a few cases the “next one” has meant next season, as the blowouts have happened in series clinchers. More often than not, that’s what has happened to all this season’s losers of the year. It reminds me a little of “taking a hand off” (so to speak) in poker after having gotten involved in several in a row, or even just one important one that required an extra dose of attention and focus. It’s the sort of thing that makes the more conspiracy-minded fans (and sports bettors) wonder about things being “rigged” somehow, since technically speaking teams are more or less conceding games (without giving it away that’s what is happening). But like I say I think it’s probably just the product of the natural rhythm of energy and attention available to non-perfect humans, perhaps exaggerated somewhat given the challenge of such a long season. In other words, the Dubs are all right, the Cavs are all right, they just seem a little weird. 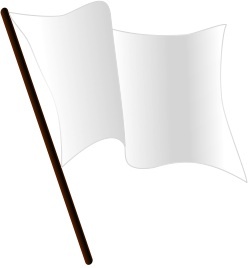 Image: “A white flag,” Viktorvoigt. CC BY-SA 3.0. You Know Uno, Don’t You? Last weekend I enjoyed a family holiday in Charleston, South Carolina, kind of a three-day weekend. In between visits to the pool, walks on the beach, and a couple of fun meals dining out, I played games with my now seven-year-old nephew, about whom I’ve written here before. He got himself a big, thick deck of Uno cards at some point in the last year, and on a couple of occasions now we’ve played, including on this trip. It might be the first card game I’ve played with him in which he doesn’t make up new rules along the way, but sticks to the actual rules of the game. That said, he has invented some sort of postscript-type game involving three cards and picking one which he breaks out at the end of every Uno game, so he’s still adding to the standard game with this one, too. If you know Uno, you know the goal of the game is to discard all of your cards before your opponent does, with “Uno” being the word called out when a player is down to just a single card. 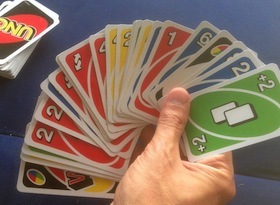 The deck is comprised of four colors (red, green, blue, yellow) with the cards numbered, and there are a few special cards thrown in as well that reverse the order of play, skip a player, force an opponent to draw extra cards, and function as wild cards enabling the player to change the current color. I believe players are supposed to start with seven cards, but my nephew likes to start with many, many more. We began with 26, actually, and that picture up top shows how difficult it was to hold that many at once (and that’s with adult-sized hands). I joked on Twitter that he likes “deep-stacked” Uno, and it’s true that starting with more cards does mean the game will go on a bit longer (ensuring there will be “more play”). In a game last weekend, I managed to get down to “Uno” twice but each time was thwarted by my nephew playing a card requiring me to draw. Then eventually he got down to one card while I only had 4 or 5. The upcard was a blue four, and I had both a blue card and a red four, meaning I could either keep it the same color or change it. I managed to talk myself into keeping it blue, and sure enough he had another blue card and won the game. When I showed him my red four he insisted I should have played it and changed the color, although I think he was just being results-oriented, knowing that had I done that he wouldn’t have won (not then, anyway). Thinking afterwards, I decided it probably was a better play to change the color, as it often happens in Uno you play several cards of the same color in a sequence until you run out, then work on the next color -- meaning the chances were probably slightly better that he had another blue card in his little hand than not. I think he’s probably about ready to learn about the rankings of poker hands. We’ve played War before, but no poker games. Simple five-card draw would have to be the best place to start, I’d think. That’s the game that has been on my mind lately, and is the first poker game I learned, I remember... probably when I was about his age. I’ve been thinking about draw poker and stud poker lately, and the idea that, in a sense, all variants can be categorized as having been derived from one or the other category of poker games. That is to say, if we created a taxonomy of card games with poker being the “domain” up at the top, draw and stud would be the top two “kingdoms” just underneath, with all the other games belonging to one or the other. In modern poker parlance, it’s common to see three categories of games identified -- flop games, draw games, and stud games. That’s a helpful system, say, if you’re choosing variants for a mixed game and want to ensure you’ve got a balance between different game types. You could, for example, have a nine-game rotation with three flop games (no-limit hold’em, pot-limit Omaha, Omaha hi/lo), three stud games (seven-card stud, seven-card stud hi/lo, and razz), and three draw games (2-7 triple draw, 2-7 no-limit draw, Badugi), which would also provide a good mix of a few “big bet” games among the fixed-limit ones. Then if you added further variants, you could try to keep the three categories balanced so as not to favor one over the others, since many players often come at a mixed game with more experience and/or knowledge in one of the three. However, if you go back in history and think about how poker was initially introduced and developed in the 19th century, it actually makes sense to slide the later-introduced flop games over and think of them as a subcategory of stud (its own “phylum,” you might say). In other words, while the hundreds of different poker variants introduce all sorts of distinctions making each unique, the most significant one determines whether or not a game can be said to derive from draw or stud -- namely, whether or not players can see any of the cards making up their opponents’ hands. Even with these two seemingly unblendable characteristics -- i.e., either all your cards are hidden, or they are not -- there exist some hybrids (we might call them) that try to combine draw and stud in some fashion. I’m thinking of draw games that involve sharing cards, of which Spit in the Ocean might have been the first step down that road (a draw game that has one card dealt face up in the middle to indicate what is wild). There are other draw games incorporating something like “community cards,” too, that seem to combine the categories. But you could argue as soon as any portion of a player’s hand is no longer hidden, the game no longer belongs to the draw “kingdom” and should be forced to emigrate over into stud. Alvarez is speaking of earlier pre-hold’em variants when making that point, but the taxonomy being suggested could still be said to include the flop games, which obviously were derived from stud. Could be fun, working out an entire taxonomy of poker variants. How would we classify Badeucy, for example? 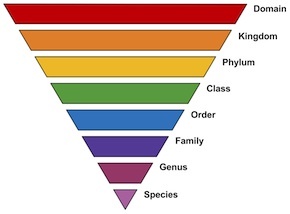 Put the Badeucy species in the poker domain, then the draw kingdom, then the fixed-limit phylum, then the multiple-draw class, then the lowball order, then the Badugi family, and finally the deuce-to-seven genus? I wrote about the first references to draw poker in this week’s “Poker & Pop Culture” column, noting how the introduction of the draw was the first meaningful variation from what might be called the “original” form of poker sometimes called “Old Poker” in which five cards were dealt, a round of betting followed, and then there was a showdown. I’ll be talking about the introduction of stud next week, and will be suggesting this point as well that all poker variants might be thought of as belonging to one of these two “kingdoms” of games. Let me know if you have any thoughts about any of this as I pull together my own. Image: “Taxonomic ranks” (adapted), Annina Breen. CC BY-SA 4.0. Tuned in to some of that first “Summer Series” heads-up match of the Global Poker League featuring the debut of the much-advertised “cube.” Not really eager to do a big, comprehensive review of every little detail of the sucker, but I did want to share just one initial impression. After eight weeks’ worth of online matches -- all of it streamed live and archived on the GPL twitch channel (whatzit, 200 hours? more?) -- the league took a week off, then cranked back up yesterday with live heads-up matches taking place inside the large glass box. Celebrity player Aaron Paul of Breaking Bad fame was pitted against Fabrice Soulier for the first best-of-three match, in prime time no less. On Twitter the comments were less frequent and more informed, with the occasional snark (“Not sure what to think about 2 guys standing in an aquarium clicking buttons,” said LivePokerPro) tending to stand out. Laughed at Change100’s comment estimating the lighting as being “somewhere between spin class and tanning bed.” Dr. Pauly’s questions “When do they flood the cube? Or release the snakes?” earned a grin. And Haley Hintze’s idea that “the walls should slooowly move in to crusssssshh the players” was rightly inspired by the evil-villain’s-lair look of it all. It looked different, that’s for sure. But then I realized -- it looked familiar, too. It was live poker, made to resemble an online game. 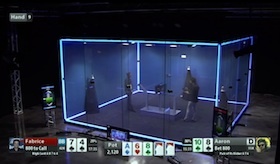 The players’ hands are shown on tablets, with a screen in the middle displaying hole cards and chips, timers, blinds/antes, and everything else also recorded on screens. In other words, there are no chips, no cards, and no dealer. The players stand as well, which produces some novel-seeming types of non-verbal communication, and probably affects the talk, too. They’ve got six weeks’ worth of “Summer Series” heats lined up. Guess we’ll see how things are standing after that (pun intended). Some time back -- oh, five or six years ago -- a fellow poker scribbler pointed out to me something about this blog, something I had been aware of but hadn’t necessarily thought about too closely before. His point was an obvious one, really. By writing a lot about the big poker tournaments and series -- posts which I often tag as “High Society,” even when the buy-ins aren’t so big -- I essentially give free promotion to those events. “They should pay you for it,” he said half-jokingly, noting how at the time I’d been writing every single day about a certain lengthy poker festival for several weeks. Now even if I hadn’t specifically thought about that particular festival and series of posts to which he was referring, I had previously given some thought to the idea that I was essentially “giving it away” here on the blog. By that point I had also been writing about poker for other sites frequently, too, and getting paid to do so. That necessarily had gotten me thinking about the relationship between time and money and how whatever time I spent writing posts on HBP wasn’t translating into a tangible monetary reward as happened when I wrote for other sites. But I decided early on there was a different kind of reward that came from writing here “for free” (so to speak). I liked engaging with the poker community this way -- and still do, even if poker blogs have moved over to the periphery as many have gravitated toward other ways of engaging with each other. I never worried too much about “monetizing” the blog, and grew to covet having this personal space to write and share ideas without any restrictions other than the ones I chose to impose upon myself. To be honest, the fact that the blog did indirectly serve as a kind of online “portfolio” that helped get me some notice and eventually some actual paid writing gigs made it easier to think that way. Sure, I wasn’t being paid directly over here, but the time spent was “worth it” in the mundane, literal sense, while also providing all those non-monetary benefits, too. The idea is to get contact information from site visitors in order to be able to market other products to them before allowing them to proceed. It’s a small hassle, this request to get something first before the site gives anything up. However, what it says about the way the site views its relationship with those who visit it isn’t small at all. Most won’t mind the hurdle, though some may not wish to try to jump over it, thereby making the content somewhat exclusive rather than freely given. The justification -- as reported by those who looked into the matter a bit further and asked questions about it -- was precisely what I’m describing, namely, a decision to stop “giving it away” and instead trying to realize some sort of payback for the content that is being provided (and for which there is some cost to produce). There was some immediate criticism here and there, including some good arguments for why in this particular instance the decision to restrict access is especially lamentable given the centrality of the site to the community. I decided to stay out of the debates (mostly), although I have complained in private to several folks as I, too, see the decision as unfortunate for a variety of reasons. I enjoy poker. I enjoy writing about it and giving others who like the game something that might add further to their enjoyment. I also like the way nearly all of the poker community -- especially those who run tournaments and series -- tend to think similarly about the overall positive that comes from freely-distributed promotion and reporting that excites players and fans alike and (importantly) nurtures the game in a broader sense. It’s my blog and I’ll write about what I want to, and I’ll never ask anyone to give me something first before “giving it away” here. But remembering what my friend said to me five or six years ago, I’m not so enthused right now to use this space to promote those who don’t believe there’s any benefit to be had from being part of a community unless you get something tangible back for everything you give. I get it -- business is business. But the poker community isn’t a poker game -- i.e., a “zero sum” situation in which no one can win unless someone else loses. We both can give and receive and still come out ahead. I mean, I’ll write about other things. Not getting paid anyway... right? 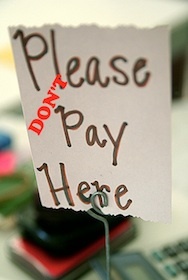 Photo: “Please Pay Here 3-14-09 19” (adapted), Steven Depolo. CC BY 2.0. Early in The Making of the President 1972, the fourth and final (formal) installment of Theodore H. White’s series on presidential elections, White discusses the monumental decision of Richard Nixon’s administration to end the free conversion of U.S. dollars to gold at a fixed value -- i.e., the removal of the gold standard. This event happened quite abruptly, going into effect on August 15, 1971. It was announced that night by the president in a televised speech that also listed several other significant economic measures, including another huge one to impose wage and price controls (a 90-day freeze). 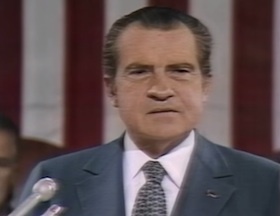 Together these measures are sometimes referred to as the “Nixon shock,” which politically speaking helped Nixon immensely in the way it produced immediate effects (helping the economy avoid a downturn during the following election year) while also giving the impression that Nixon had done something meaningful -- had acted, not sat by passively -- in response to a coming economic crisis. (That latter point is one White fleshes out in the section). Meanwhile the longer-term effects are still being debated (and are beyond the scope of this post). By the early 1970s, though, the economic supremacy of the U.S. was no longer quite so unamiguous. Other countries’ economies had built back up to the point of being competitive, in part (explains White) because of the U.S. having been generous with aid over those years. “So strong was America in those days that its overpowering investment in science and fundamental research was thrown open to the entire world,” writes White, who also notes other forms of civilian aid to foreign countries. That’s when White uses a poker metaphor to describe the situation, and in fact it’s a familiar one to those of us who know our Nixon. “Uncle Sam sat like a winning poker player at the head of the table, giving away chips to the losers, even tipping his hand when necessary just to keep the game going,” writes White. I say this is a familiar comparison, because Nixon himself used this exact analogy in a speech he subsequently gave on September 9, 1971 to the House Chamber at the Capitol in which he addressed the country’s economy and its relationship to other countries. I’m not completely sure, but I believe the statesman to whom Nixon refers might be Winston Churchill, who did play poker occasionally (including once famously with Harry Truman). (The reference to 15 years before suggests one of RN’s meetings with Churchill when Ike’s VP.) In any event, it’s essentially the same point White makes, although White doesn’t quote or allude to the speech to Congress when he makes the analogy (making it seem perhaps as though he’d come up with it on his own). Incidentally, Nixon and his aides can be heard on the White House tapes discussing this passage a lot both before and after the speech. This was true. Nixon’s poker-playing background wasn’t a secret -- in fact, it had been described at length in a Life magazine cover story about “The Young Nixon” in November 1970 -- but it wasn’t nearly as well known among most of the public as was Truman’s penchant for poker. The line does convey the idea, no doubt. It’s memorable, too, which is why when reading White I immediately recognized it. Still dealing with pre-Civil War poker during this week’s installment of “Poker & Pop Culture” over on PokerNews. The columns are following a chronological narrative, especially early on, although I imagine once we get to the later 20th century I will open things up a little and not be as attentive to the history-of-the-game side of things. With this one I share some details from an entertaining early poker story told by the English actor Joe Cowell in his memoirs. The book was published in 1844, and the story he tells concerns his being introduced to poker aboard a steamboat back in 1829. The story is fairly diverting, though it’s a digressive reference to Henry Clay by Cowell that I mostly focus on in the article. Cowell repeats the idea that the Kentucky politician actually invented poker. It’s an entirely spurious claim although still interesting given the fact that Clay was running for president (the fourth of five tries by Clay, none successful) the very year Cowell published his memoirs. 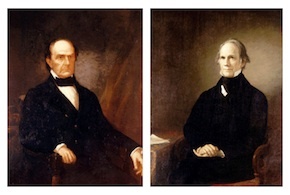 I follow the Clay thread a bit to talk about some other likely apocryphal tales of him and fellow politician (and failed presidential candidate) Daniel Webster playing poker against each other, something they certainly did although the stories of their games seem more than a little embellished. Reflecting the cultural significance of poker circa the mid-1840s (still a relatively new game), supporters of Clay’s opponent, James K. Polk, publicized Clay’s poker playing as reason not to vote for the candidate. Was up late last night with work, and as I’ll sometimes do when that happens I got into one of those YouTube loops of somewhat aimless clicking around. Was in the mood for music and so had happened on a few live clips of various bands, then somehow from that path strayed onto the one containing clips documenting the “Dark Side of the Rainbow” -- you know, that phenomenon that didn’t really get much traction until the 1990s (if I remember correctly) having to do with the way Pink Floyd’s 1973 album Dark Side of the Moon uncannily syncs up with the 1939 film The Wizard of Oz. I suppose that whole thing had to have started with LPs and VHS tapes, though now it’s easy enough for anyone to reedit the soundtrack of a film and upload the sucker. Like practically everyone of my generation and before, I saw The Wizard of Oz many, many times growing up. It was one of those annual things, shown on the teevee frequently and thus committed to my memory just like it was to many others’. Doubt that’s the case so much anymore, perhaps making it a much less conspicuous “text” than it had been before. As a preteen one of the very first LPs I ever got was The Wall, then Dark Side followed shortly thereafter, meaning that, too, is a cultural product I’ve experienced numerous times -- hundreds, I guess. 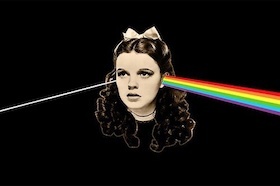 But I’d never actually bothered to check out the whole “Dark Side of the Rainbow” thing, knowing it was essentially just happenstance and not intended by the band in any way. The human mind seizes on repetitions and parallels, sometimes imposing patterns when they aren’t really there, if only because of the pleasure and/or comfort they bring. Poker players are perhaps more aware of the existence of this psychological quirk than most. Nick Mason, the drummer, had a great quote about it back when it became talked about enough for folks to start asking the band members about it. “It’s absolute nonsense,” said Mason, echoing what others in Pink Floyd said when asked about there being any intention for the Dark Side of the Moon to be listened to as accompaniment for the film. Anyhow, I didn’t have patience to sit through an entire showing of the film with the LP playing (two-and-a-half times over, necessarily, given the differences in lengths). But I did enjoy a few of the more curious moments that come up, including the way Side 2 begins just as the film switches from black and white to color, the Tin Man’s heartbeat, “home, home again” coming back around when Dorothy wakes up at the end, among other fun moments. Easily the most affecting stretch, though, is the whole of “The Great Gig in the Sky” which nearly matches the entire tornado sequence during which Dorothy (and Toto) hits her head and blacks out, then the farm house gets picked up and dizzyingly spins through the air in a surreal and scary way before landing just as the song concludes. It’s an incredibly inspired piece of filmmaking. The song, too, is a marvel I somehow still find moving after all these years. Clare Torry’s wordless vocal perfectly articulates the thematic mediation on mortality, or the cycle of life, or whatever else her singing and the tumbling chords underneath makes you think about.